I just got my new HH210 and this is my first time mig (well flux core until I go get gas) welding, I was practicing on some scrap I have laying around, wanted to get some opinions and tips/pointers on my first welds! You need to clean the areas of the metal you are welding at the intended welded area. Some of the pics showed weld where the slag had not been cleaned off. It makes for better viewing. A little more info would help also, as far as recommendations are concerned, ie settings, wire size, etc. It is important that the weld fuses the pieces your welding together. I say this not to be a smart-a$$, but for guidance. The first time my son used a mig welder, he had a beautiful bead, but he dropped the plate and the bead fell off. From what I can tell, your getting there. The thing about all types of welding is practice, practice, practice. I am a fine one to talk, I don't practice nearly as much as I should, of course I just use my welders for hobby and small repairs or fabrications around the house. There are others on this site are better qualified to advise you than I, but I thought I would share this experience with you. Hope you the best, and welcome to the site! Last edited by Knowledgeworker; 04-06-2009, 12:07 AM. Reason: Added welcome. If you can't dazzle them with brilliance, Baffle them with bull$***. Clean it off with a wire brush after you weld. I cant tell anything about it because it is so dirty. Mine always tend to look like this, which is listed as too slow of travel speed, but IMO, it's a fine weld; clean, strong and purdy. And it's not fluxcore, either. Sorry, I would have cleaned it up but I didn't have a wire brush, Ill take some more pictures after I get it cleaned up. As for the strength I would say it is pretty strong. I tried everything I could to break the weld and I couldn't even bend it. What are your settings? Is your polarity correct for flux cored? E71T-11 or E71T-GS? I ask because you have a high level of spatter for a 210. 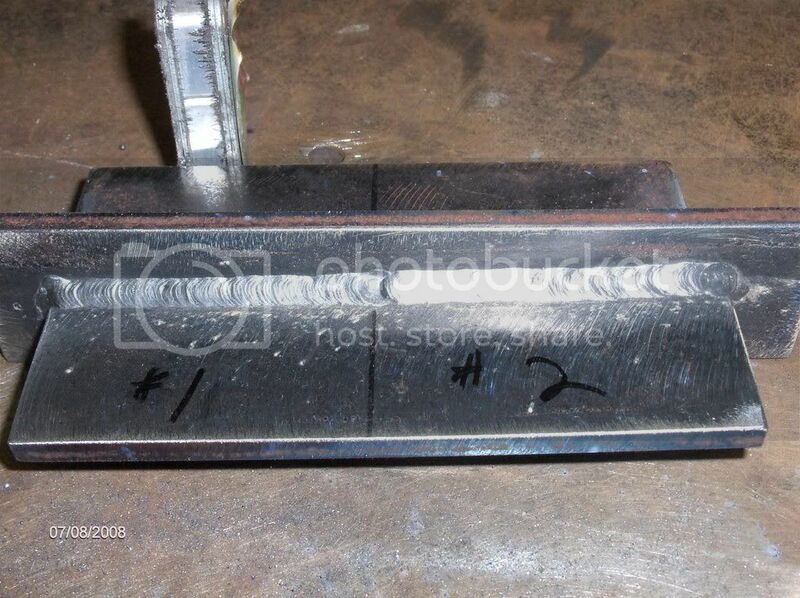 Here is a weld on 1/4" I did with a HH210, 030 E71T-GS. I was goofing around and decided to check how a 210 handles FCAW. Much to my surprise, it was a spatter free weld before chipping. It appears like a little afraid of it, jerky and unsure of travel speed...this is normal...steady your gun hand by supporting it o something, travel smooth and allow the slag to be pushed back on your weld... drag or pull the weld, like it shows in the manual...it helps to draw guide lines to show the width of the desired bead on the plate with soapstone first. Here is a correct bead on 1/4"
Whoa!..I never meant to discourage anyone by showing my stuff,...I only want to show what YOU CAN do with this equipment! Sure, I've been welding 55 years, so I have picked up a few tricks that I would like to share, so that you can try to achieve in a shorter amount of time than it took me. Never say "I don't expect to ever get in the same ballpark" because if you do, you will never get there. Rather be positive and say "If he can do it, so can I" and you will. Welding school or help from experienced welder like rocky will speed learning to make great welds. Watching welding instruction videos is distant 2nd best because your missing instructor correcting mistakes and telling you what your doing right. Many hours of practice and projects you'll be pretty good. Then welding 8+ hours a day making welds that pass inspection you to will make great welds because anything else isn't good enough.